Photography is easy. All you have to do is invest in a really good camera and be in the right place at the right time. Or at least that’s what I’m told by people who aren’t photographers. I always respond that while it’s important to have good lenses and an adequate camera, equipment is actually a pretty minor part of good photography. The most important quality of a photographer is the ability to recognize and take advantage of various lighting conditions. …It doesn’t hurt to have patience and perserverance either. 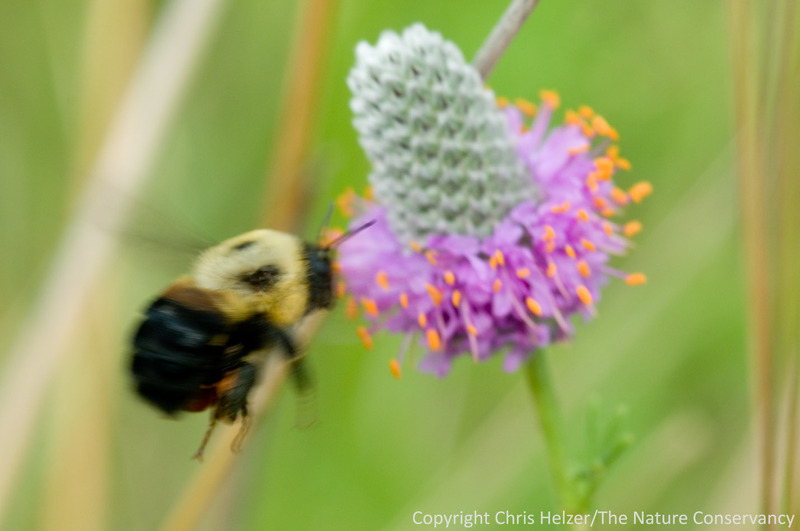 Just last week, in fact, I was trying to photograph bees on prairie clover and used up almost all the patience and perserverance I had with me at the time. I thought some of you might enjoy seeing how many of my photography days go – instead of just seeing the final photos I select from the hundreds of rejects. Those of you who are photographers will probably emphathize with me, and those of you who aren’t will get a window into the process. All of you will probably have a good chuckle at my expense. So be it – it’s a holiday, after all – have some fun. The thing about bees is that they never seem to hold still. 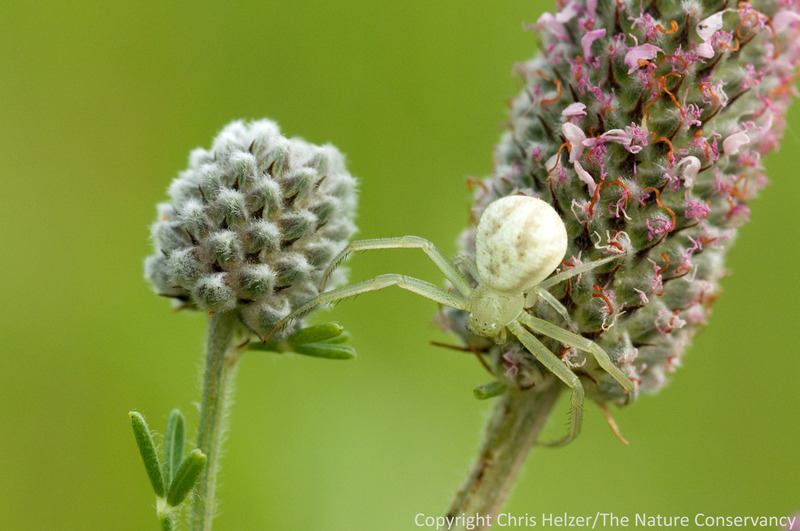 It’s not just that they keep crawling around a flower – they move REALLY FAST! I’ve got lots of photos just like this from about 15 minutes of trying to get one stupid photo of a honey bee. 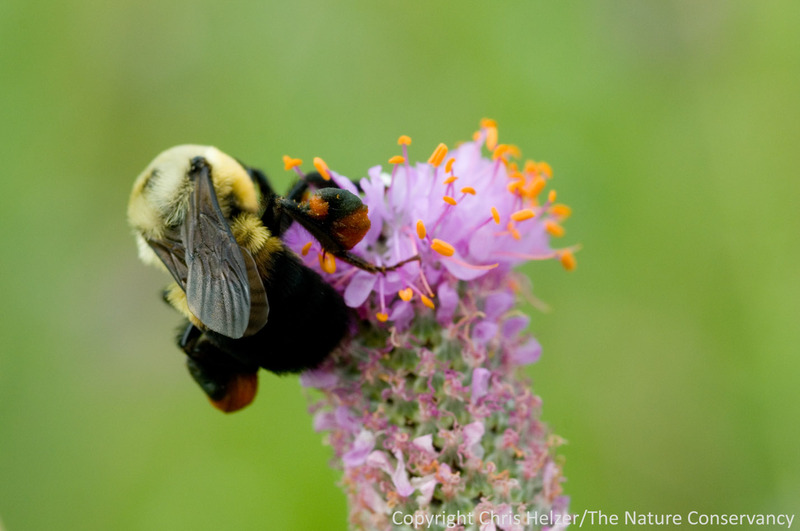 There were hundreds of them buzzing around a big patch of prairie clovers, and they weren’t hard to get close to. They just never stopped MOVING. With insects, and really all animals, it’s critically important to get the eye(s) in focus, because that’s where the eye of the viewer is drawn. If the eye isn’t sharp, the photo is pretty much junk. So there I was, trying to focus on the eye of a bee that was flying and crawling around flowers like it was hyped up on Mountain Dew. Oh, and there was a good wind blowing the flowers around too. That was fun. 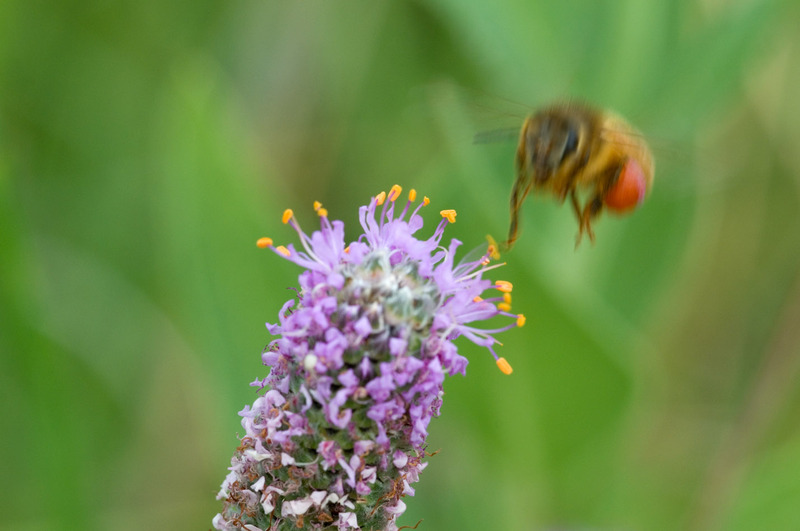 In this photo, I didn’t manage to get ANYTHING in focus – mainly because the flower and bee were both moving too fast. I did eventually manage to get a decent shot of the backside of a bumblebee. This is the exception to the rule about getting the eye in focus. If you can’t see the eye, it doesn’t matter… In this photo, the important part to be sharp is the pollen basket on the bees right side – and it’s pretty good. Finally, I managed to get one sharp photo of a honey bee. Though much of the bee is a little fuzzy (so to speak) the eye is reasonably sharp, and so is the flower. You can click on the photo to see a clearer image if you want to. Out of about 15 minutes of photography and a couple hundred frames, I ended up with three decent bee photos (including the bumblebee’s back side). Since I was running out of both memory card space and patience, I switched over to easier (slower) targets. Soldier beetles are still abundant, and apparently like to take their time and enjoy their meals a bit more than bees do. 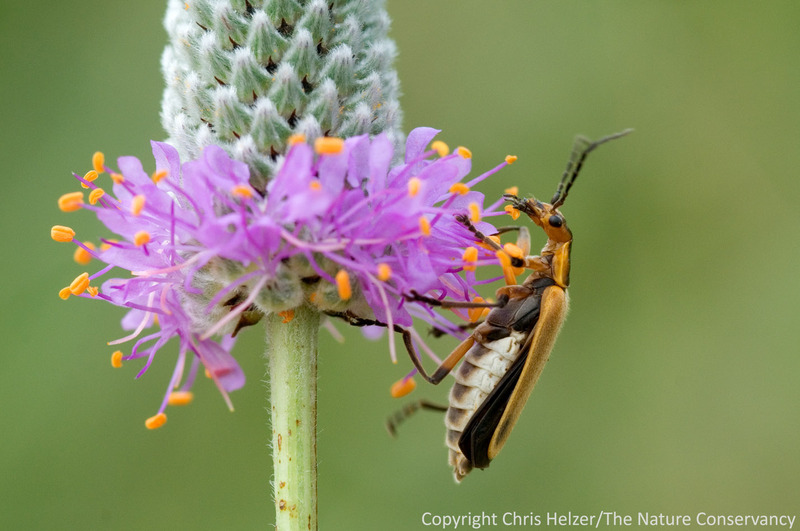 I think I got three or four good soldier beetle photos out of eight or ten tries. 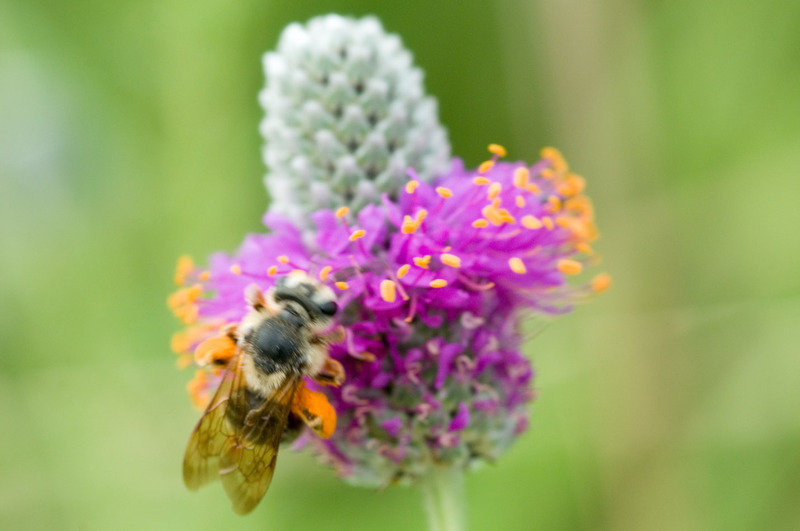 This entry was posted in General, Prairie Insects, Prairie Natural History, Prairie Photography, Prairie Plants and tagged bee, camera, image, insect, macro photo, nature, photography, pollinators, prairie clover by Chris Helzer. Bookmark the permalink. 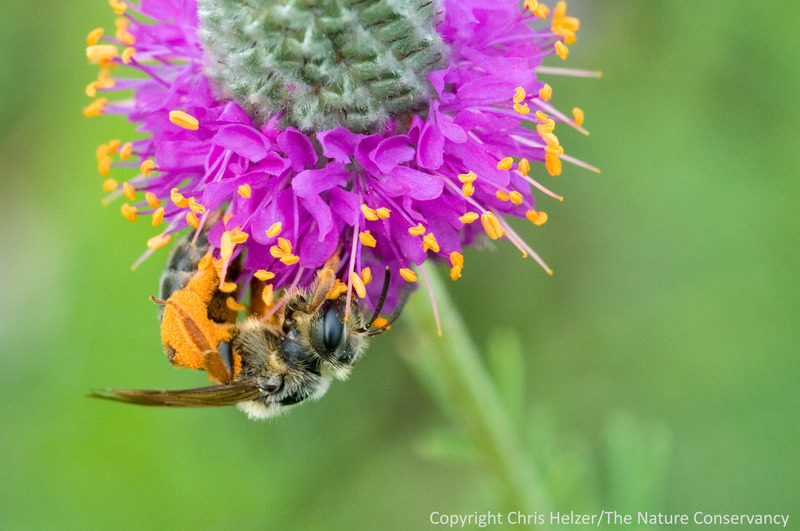 Your focused “honey bee” is not that species. Details from Mike, next week . . .
Aaak! But it LOOKS like a honey bee… Sigh. I stink at bee identification. Yep, will be great to have you and Mike here next week to set me straight! Thanks Mike. I’m looking forward to a week of your expertise. Maybe we’ll even find a honey bee for you to identify for me!! Chris – your prairie photos might be responsible for my purchase of a 100mm f2.8 1:1 macro yesterday :) I’ve already learned that even a slight breeze is too much…and my tripod adjusting skills need some serious work. I can untangle Christmas lights quicker than I can get my camera in the position I want! I will say that it slows things down and you notice a lot more of your surroundings. – do you always use a tripod with your macro? – do you generally do mornings and evenings in indirect sunlight? – is there an aperture range you usually stick within? Mike – congrats on your new lens, I hope you love it! – I use a tripod whenever possible; it helps me think about composition more carefully and is essential for the slow shutter speeds I need for most close-up photos. Only exceptions are when I’m shooting subjects that are moving too fast to keep up with a tripod. Bees and other pollinators are on the edge, and I use a tripod sometimes and hand-hold the camera others. They’re usually flying when the light is strong enough that I can use fairly fast shutterspeeds and still have the aperture I need (see below). – Not necessarily indirect sunlight, but yes, mostly I shoot mornings and evenings. Close-ups are also very good in bright overcast light (cloudy, but bright enough to almost see shadows). If the sun has color to it, the light hitting subjects will be pretty too – and not so harsh that it overwhelms the camera’s ability to process the full range of bright to dark. – With close-ups I shoot with the largest aperture number I can manage with the shutterspeed I need. When you use the full ability of that 1:1 macro and are shooting very small subjects, your depth of field is really tiny, so the more you can get the better. I’d go wide angle next, but that’s just my own personal bias. Have fun! Chris, You actually do not want to use the largest aperature numbers available. As the hole in the diaphragm gets smaller, the quality of the image deteriorates. The trade off of more depth of field at high aperature numbers is not worth the deterioration in image quality after a certain point. There is an optimum that is much less than the maximum available. I would have to look up how to calculate the optimum since I have not done the calculation in years. However, I believe the optimum aperature number is specific to the size of the final image. Chris – thanks for your reply. After my first few shots I think I’m going to really enjoy this lens. I took these before your response and most at f4 or lower. I’ll have to try your higher aperture settings this weekend to get more in focus. There is some large fly that is maybe laying eggs in a grayhead coneflower? I also have a bunch of fast moving bees with fat yellow back legs and got a few shots. This is hilarious!! I have had the same experience many many times. Another favorite is a razor sharp pix of a spot where the bug was just a moment before….but is no longer even in the frame. You seem to spend a lot of time chasing your photo subjects around. Even (or should I say, especially) when you’re taking our Christmas portraits. You sound like me trying to photograph dragonflies! I have only recently been introduced to your blogs and am really enjoying them. I have an interest in recognising, preserving and rehabilitating grasslands in Victoria, Australia so am finding your comments as well as photos very interesting. I am heartened to learn that not all your photos are quite as you hoped or intended but I love most of the ones I have seen. Thanks Liz! Welcome aboard. I’m glad you’re enjoying the blog so far. I’d love to hear your perspective on the various topics we deal with. There are several of you from Australia (as well as from some other countries outside the US) following, and it makes the discussion much more rich. 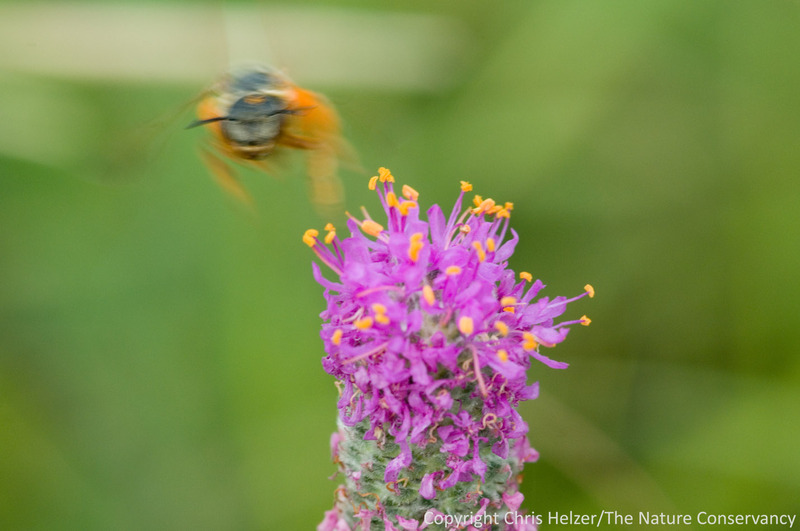 Use a fast shutter speed and your flash – then even if the bee is moving it’ll look like it’s in focus!! Chris, your attempts to photograph bees really made me smile. I had the same experiences trying to photograph bees visiting flowers of *Chilopsis linearis*, a desert tree. Even with the flash, the wind whipped the flowers so much that I couldn’t get a shot in focus. 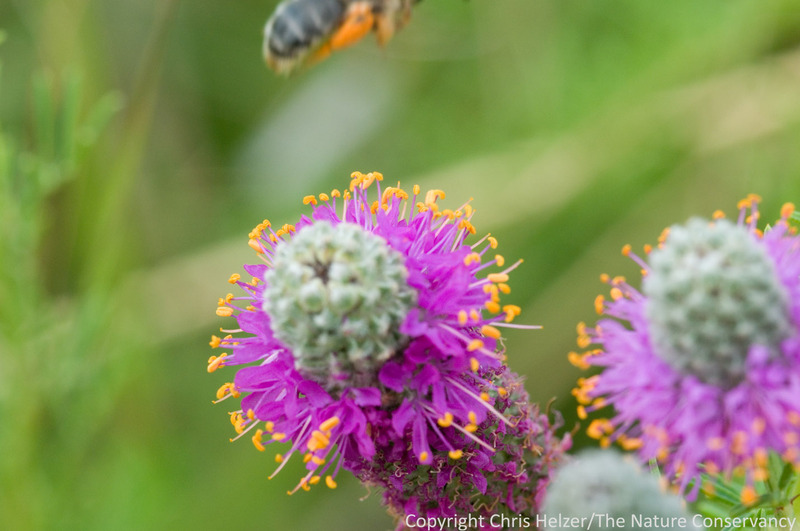 The bees were so fast that most shots didn’t even include a bee. I tried catching the bees, slowing them down by putting them on ice in a cooler, then replacing them on flowers to take the photos while they warmed up. In the desert heat, the bees just took off. Finally, so that I could give talks on my research, I had to kill a bee of each species and use rubber cement to glue them to flowers. The entomologists in the audience laughed because the wings were in the wrong position, but everyone else was fooled.